for CUZZI Computer Desks and Carts. Improve the rolling capabilities of your computer desk with this set of 3" commercial-grade rubber casters (PU). Many computer, laptop carts and other compact rolling devices come from the factory with 2" casters, which are acceptable for regular use on smooth floors or thin carpeted floors. Nevertheless, for continuous portability and commercial use or to simply achieve a smoother "ride", larger 3" rubber commercial grade casters (wheels) are recommended. 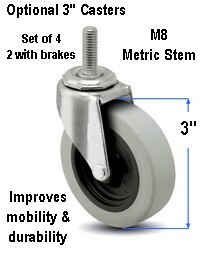 - Metric stem: it is important to notice that these casters come with metric stems. Most casters available in the market come only with standard stems and cannot be installed to upgrade the rolling capabilities of your cart. The standard spec stem will not thread into the threaded hole in your unit if it has a metric stem. Our casters fit on all CUZZI Desks and on any item that uses a M8 metric stem (pitch 1.25) (up to 22 mm. long). If this stem is too long for your application, it can easily be cut with a hacksaw. 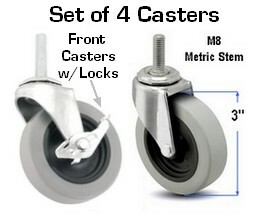 These casters (wheels) come in a set of 4 casters, two with locks (brakes intended for the front) and two without (rear). The ones for the front include a pedal-type brake, to hold your computer desk or cart in place.